Mercer Culinary Genesis Knife Set Review - One Set To Rule Them All? It has been some time since we last had a look at kitchen knife sets. Today, we are going to fix that by reviewing the Mercer Culinary Genesis 6-Piece Knife Set. Mercer is no rookie in the cutlery industry, having been in the business for more than 30 years. Their kitchen knives are regarded as some of the best value knives and are especially popular in the US. Unlike the other premium brands like JA Henckels or Wusthof, you are most of the time going to pay less money for a Mercer knife set. That is in my opinion always a good thing. The question is – is the knife set actually any good? Let’s have a look! The build quality of the knives included in the set is excellent. All of the knives are full tang, which means the knife is made of one piece of steel running from the tip of the blade to the end of the handle. A knife without a full tang can break easily where the handle joins the blade part. The knives are all made of high-quality German X50 CR M V15 steel, which is resistant to rust and corrosion. What’s really nice about the knives is the fact that they are forged. That means the knives are made of a single bar of steel which is then pounded into the required shape by a machine or a human craftsman. A typical sign of a forged knife is the presence of a bolster at the end of the blade. Most of the cheap knives out there are stamped from a steel sheet and then honed and heat treated. When it comes to handles of kitchen knives, it is a good idea to select a knife with a non-slippery handle. This is to avoid kitchen accidents and the need to call an ambulance. Fortunately, that is exactly what the Mercer Culinary Genesis knife set offers. The handle is made of a rubbery-feeling Santoprene material. It is non-slippery, providing a good grip even with wet hands. I found the ergonomics of the handles quite good overall. However, the grip seems to be slightly bulkier than that of the competitors such as Wusthof. As always, it’s best to avoid putting the knives into a dishwasher. Wash them by hand instead and they will stay sharp for a long time. What Knives Are Included in the Set? This run-off-a-mill combination of knives is exactly what most people will ever need. You will have no troubles with pretty much any kitchen tasks, be it preparing meat or chopping vegetables. You may want to enhance the set by adding more knives. I would add a Santoku knife such as the Mercer Culinary Genesis 7-Inch Forged Santoku and possibly a fillet knife. Please keep in mind there are no extra slots for other knives in the block. There’s no serrated knife which would be useful for tomatoes and other soft fruit and vegetables. On the other hand, the bread knife can be used to substitute such knife. If have checked a listing of the block, you surely know, there are two choices you can make. You can get the knife set with a temper glassed block and a wood block with tempered glass. The choice is in my opinion purely personal and depends on your preferences. I would say the tempered glass block would look better in a modern hi-tech kitchen. Whereas the wood block is more suited for the classic looking kitchen. One of the things that you might not like about the blocks is that the knives are stored upright. As a result, you may face issues trying to fit the set under some of your kitchen cupboards. That’s likely not a problem for most of you, but keep that in mind. Otherwise, you will have to tilt or move the block every time you want to take a knife out of it. 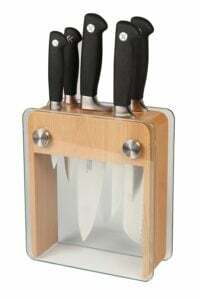 In case you would like to measure whether it will fit, the knife set is about 14.5 inches tall. Another thing to keep in mind is that the wood black is slightly more expensive. Being one of the best-rated kitchen knife sets on Amazon with hundreds of positive reviews has to mean something, right? The Mercer Culinary Genesis knife set is praised for its price-performance value and for the general quality of the knives. Many of the reviewers also like the look of the block. 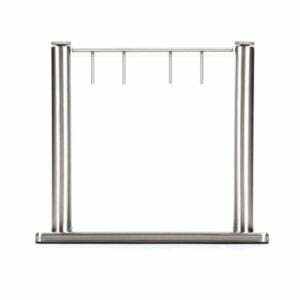 Its design draws the attention of anyone visiting their kitchen. If you would like to read the customer reviews yourself, you can check them here. If I would be looking for a more expensive quality alternative, I would have a look at the Wusthof Classic 7-Piece Cutlery Set. This is a set which comes with a nice block and scissors as the 7th piece. 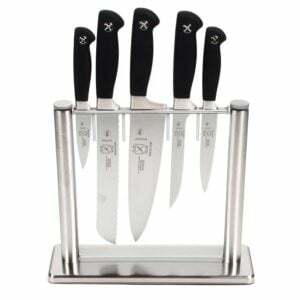 On the cheaper side, you can also have look at the Utopia Kitchen Stainless Steel 6 Piece Knives Set. Of course, don’t expect the same quality as the Mercer knives. The Mercer Culinary Genesis knife set offers a great quality at a reasonable price. As a result, there’s not much wrong to say about it. These knives are time proven and are among the most popular knives available on the US market. If the price and the knives in the set are right for your needs, there’s no real reason to look elsewhere. That’s it for the Mercer Culinary Genesis review. See you next time. Excellent 6-piece knife set at a reasonable price.